The New York Times has a piece by Ellen Barry entitled Barriers that are steep and linguistic about linguistic aspects of the situation in Georgia, which quotes both me and Johanna Nichols, who unlike me is an authentic expert on the languages of the Caucasus. As newspaper articles go this is actually pretty good, but I thought it might be useful to fill in some of the details. It may help to look at this map of the ethnic groups of the Caucasus. The languages unique to the Caucasus fall into three universally recognized language families. Georgian, along with Mingrelian, Svan, and Laz, belongs to the Kartvelian family, also known as South Caucasian. The other languages are divided into the Northeast Caucasian family and the Northwest Caucasian family. 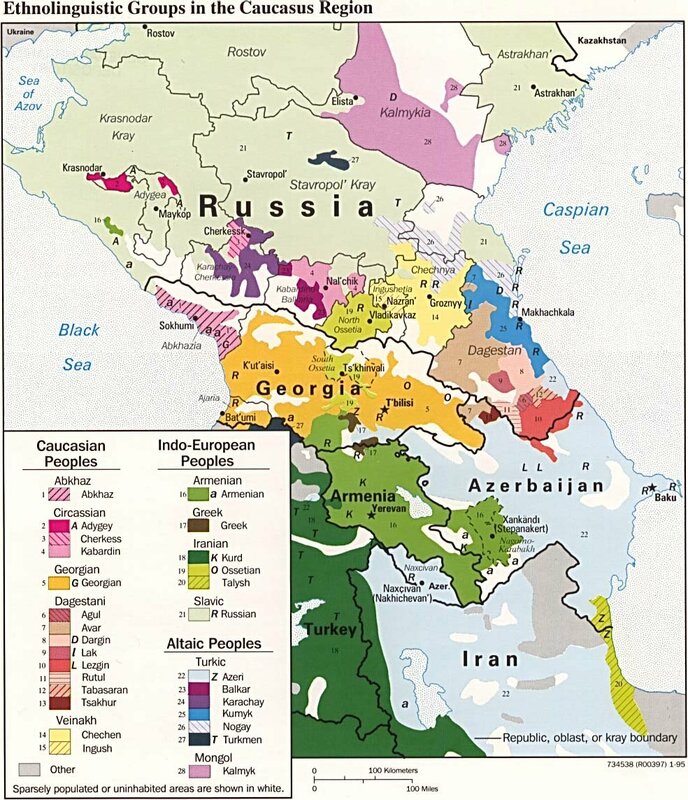 Northeast Caucasian includes Chechen, the language of the region that has been at war in recent years with Russia. Northwest Caucasian includes Abkhaz, the language of one of the disputed regions of Georgia, and Kabardian, famous in some circles for its putative lack of vowels. As far as the consensus of historical linguists is concerned, this is as far as it goes. There are, however, hypotheses, that lead much farther afield. To begin with, some scholars believe that Northeast Caucasian and Northwest Caucasian are related and form a family known as North Caucasian, or simply Caucasian. This in turn, they argue, is related in the West to Basque, and in the East to Yeniseian, Sino-Tibetan, and Na-Dene. The connection between Yeniseian and Na-Dene has recently gained acceptance among even hardliners like myself due to the work of Edward Vajda, but the rest of this chain of relationships is considered by most historical linguists to be undemonstrated, though viewed with greater favor in Russia. On this "Vasco-Dene" hypothesis, Georgian is not considered related to any American Indian languages or to Basque. It is Kartvelian, not North Caucasian. However, to complicate matters further, Georgian has been proposed by other scholars to be related to Basque. This should surprise no one since Basque has been proposed to be related to practically everything. Anyone interested in the history of Basque, its various proposed relationships, and why these proposals are dubious, should consult The History of Basque by the late Larry Trask, which is the definitive work on the sujbect. John Colarusso has linked Northwest Caucasian With Proto-Indo-European (http://en.wikipedia.org/wiki/Proto-Pontic). Quite where the speakers of PIE actually lived is, I understand, still debated, but they could have been close enough to the Caucasus for mutual influence, even if they have no traceable genetic connection. Yes, there are a number of proposals for relationships between Caucasian languages and Indo-European, as well as proposals of influence of one on the other due to contact. None of these proposals is widely accepted, but some of them are at least interesting. The geography is certainly plausible whether the Indo-European homeland was north of the Black Sea or in Anatolia. Having lived in Hungary, I've heard and read a little about the amazing amount of movement of peoples that has taken place in eastern Europe over the centuries. But I've only just discovered that there is a kinship between the Ossetians and the Jászok of Hungary. A propos of nothing, four years ago in Boston, I had a conversation with a cabdriver who was a native speaker of Lak, a language spoken in Dagestan that I had actually heard of, although I regret that I didn't have a chance to collect field notes between Back Bay and Harvard Square. Bill (if I may), though I'm not a linguist by profession, I'm working my way through your and Prof. Campbell's new book with great interest. For those interested in the subject of Indo-European origins, a nice introductory book is In Search of the Indo-Europeans by J.P. Mallory. This book covers the hypothesized movements of the Indo-Iranian branch, along with some of the evidence for various origins, many of which are in the vicinity of the Caucasus region. The Times article mentions a Georgian clan named Machabeli. Years ago there was a brand of upscale perfume sold in the US under the name "Prince Matchabelli." Is there subtle implication in the New York Times article that very existence of linguistic diversity in the Caucasus is necessarily a barrier to peace and understanding? Or am I reading too much into it? I'd wager not. Lingusitic diversity vis-a-vis geographic identity has worked. In India. But then again, only in India (I am leaving out Louisiana for the moment). So, not necessarily a barrier to peace, but quite certainly a barrier to understanding. The map shows some Greek enclaves, North of Armenia. Do these date back to Byzantine (or even Hellenistic) times, or are they more recent? I don't for a moment believe that linguistic diversity is a 'barrier'. I was simply wanting to draw attention to the fallacious assumption, sometimes held by monolinguals, that linguistic difference entails conflict. Wondering if there is something between the lines of the NY times article. There is a claim that some of those enclaves are in fact hellenic, not hellenistic, perhaps part of the same migration that produced the ionians. Supposedly there is a whole neglected history of greeks going east, parallel to the westward colonization of Sicily and Magna Graeca. At least that's the claim in one book. It's in the collection i inherited from my father, i'll see if i can find it. Linguistic diversity is necessarily a barrier. How can it not be? It appears to me that there is much less tension among people who speak the same or a similar language than among people who speak mutually unintelligible languages. Linguistic diversity is a barrier only to the extent that people are monolingual, and much of the world is multilingual. The classic example is the Vaupes in the Amazon delta described by Jean Jackson in her paper "Language Identity of the Colombian Vaupes Indians." Among the Vaupes, who make up one social structure, are more than 20 distinct languages, but these are not associated with discrete terittories. Each person speaks at least three languages fluently, many speak more. To a certain extent there is identification with one language, that of the father, but that is not exactly the same as the language of home, as marriage pratice requires one to marry a spouse from a different language. As a result, even the nuclear family is necessarily bilingual. It should be added, that as Hymes laid out in "Linguistic Problems in Defining the Concept of 'Tribe,'" mutually intellegibility is not a strictly technical issue. People in group A may claim that they and group B speak mutually intelligible languages, while people in group B will maintain that they are mutually unintelligible. Who understands whom is a social issue as much as anything else. Certainly one can technically show that languages are related, but whether or not various groups take advantage of this relationship is a different matter altogether. How linguistic diversity does not necessarily create the relations among groups, although groups may use that diversity to explain other differences. I think that is a rather extremely simplistic view. Consider for a moment the level of tension between, say, France and Germany who speak mutually unintelligible languages compared to, for example, Iraqi Arabs or the people of former Serbo-Croatia or the like who speak the same dialect of the same language and yet have or have had a murderous level of tension within their society. I agree with Piers Kelly on this point. In any given geographical or historical or cultural setting a high level of linguistic diversity is just as often a source of greater multilingualism as it is otherwise. People aren't limited to knowing one language, and multilinguilism in of itself cannot, I think, be said to be the source of tension between groups. Rather, I would wager that in any given situation it is some cultural or ideological difference at the root, and since often language is the most conspicuous badge of membership of a culture, it may be mistaken for being the source of the tension rather than the underlying cultural conflict. Given an underlying cultural conflict, the members of these speech communities are likely going to be more disinclined to learn the other side's language, which may exacerbate communication issues or differences, but those are still not the actual cause of the conflict but a side-effect of it. It appears to me that there is much less tension among people who speak the same or a similar language than among people who speak mutually unintelligible languages. Or, if you prefer, Rwanda or Yugoslavia in the nineties. This is not socio-poltical forum, so I'll stop with this. A linguistic identity confined within a geographic border reduces tension with other indentities outside that border. Multiple linguistic identities within a defined geographic border increases tension within the border. That was my point. In my house, I speak X. In yours, you speak Y. The issue is not with X & Y, but with the houses. In the Caucaus, mutliple ethno-linguistic identities do not (have not?) followed explicit geographic differentiators. And hence. That may be, but different linguistic groups tend to go their own separate way and reach a different consensus from one another on social and political issues. This in turn, opens up a whole range of possible misunderstandings. Here in Belgium, what seems perfectly sensible to one group, often is considered completely absurd by the other. This is not confined to linguistic politics in the narrow sense, but also to social and economic issues, such as immigration, or the organisation of health care. On the other hand, as we Belgians have proved, linguistic may cause political differences, it does not necessarily cause war of violence. In the first sentence Bill Poser wrote, "The New York Times has a piece by Ellen Barry entitled Barriers that…" Using "entitled" to mean "having the title of" stopped me. Having always believed this should be "titled" I looked it up. Carnegie Mellon University at: http://www.cmu.edu/styleguide/trickywords.html confirmed the tricky word usage. Other authorities disagree, though. Would you care to elaborate? a. y. mous: A linguistic identity confined within a geographic border reduces tension with other indentities outside that border. Multiple linguistic identities within a defined geographic border increases tension within the border. This sounds like you're quoting some sort of established fact of the world, but I can't imagine what proof you could possibly provide that would support this that wouldn't have just as many easily available counterexamples. Even if you're only defining "geographic border" as a defined political boundary, or just as a topological boundary, history is so full of counter-examples of this as to soundly refute it. Further, how could you possibly claim that India is the only example of a (currently) peaceful multi-linguistic country? Again, there is such an overwhelming body of evidence, historical and contemporary, that counters this that I'm baffled by what sources you could be basing this claim on. Can you give some examples where language alone, and NOT cultural, political or ethnic forces are to blame for tension? I would genuinely like to know what evidence your claims are based on. In regards to Alex B's comment, I think that overwhelming evidence would point to the tensions that divide along linguistic lines in Belgium can be seen to stem from cultural tensions that date back to the formation of Belgium as a country, not from the fact that the two groups concerned also happen to form different language communities. There also seems to be an exaggeration in the article where Ms. Barry claims that this region is one of the most ethnically diverse areas of the world. While I think that honor may indeed go to Papua New Guinea, the state of Oaxaca in Mexico is home to at least 50 languages (being quite conservative) from 3 or more different language stocks (Otomanguean, Mayan, Mixe-Zoquean). California was also once home to a greater degree of ethno-linguistic diversity, with approximately 100 different languages spoken prior to the arrival of the Europeans (although only about 50 of those languages still have speakers). Probably what was meant was the density, the number of languages per square kilometer, where the Caucasus is very close to the top indeed. There are many one-village languages. Well, actually, it's probably the number of languages per 10,000 people (this number may be greater than 1), not per area.